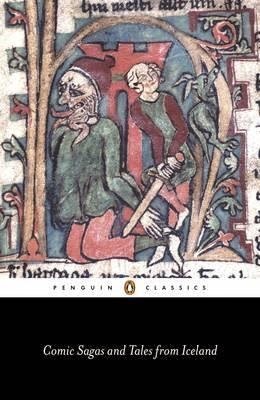 Comic Sagas and Tales from Iceland brings together the very finest Icelandic stories from the thirteenth to fifteenth centuries, a time of civil unrest and social upheaval. With feuding families and moments of grotesque violence, the sagas see such classic mythological figures as murdered fathers, disguised beggars, corrupt chieftains, and avenging sons who do battle with axes, words, and cunning. The tales, meanwhile, follow heroes and comical fools through dreams, voyages, and religious conversions in medieval Iceland and beyond. Shaped by Iceland’s oral culture and its people’s conversion to Christianity, these stories are works of ironic humor and stylistic innovation. I enjoyed reading this collection of comic sagas; although, in general I think I prefer the more heroic/dramatic tales. Still this is an interesting and diverse addition to any library of Old Norse/Scandinavian literature. I am gradually trying to read all the available sagas and Eddic/Skaldic poetry and this does make a pleasant contrast to the hero and historical sagas I've read so far. Ref the Sly was one of my favourites in this set of stories. Plus I found the shorter Tales very entertaining.